British politicians and planners are using the 2012 Olympic games to “revitalize” the Lower Lea Valley, a post-industrial landscape, situated between four inner-suburban boroughs in the East of London, including West Ham, which was the focus of my dissertation research. A century ago R. A. Bray described West Ham “as that of a spot somewhere near London to which people went with reluctance if they had business there, and from which they returned with joy as soon as the business was over.” Sadly, I don’t imagine most people would describe it any differently today. 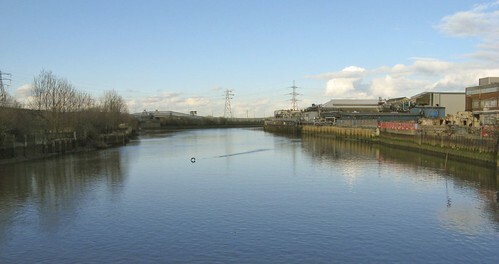 Half a century of rapid industrial and population growth in the second half of the nineteenth century transformed the once green wetlands of the Lower Lea River and Thames Estuary into a dirty manufacturing suburb with a range of social problems that matched the extensive environmental decline. Despite this troubled history and the scarred landscape it left, I would suggest travelers to London should venture eastward and see a different side of London from the regal and imperial parks and buildings in Westminster. The Docklands Light Rail lines make it easy to travel through East London and they are above ground, so you can see where you are going. Most of the West Ham sites listed below are within walking distance of a DLR station. The Olympic Park: While the stadium is visible from a lot of places in the Lower Lea Valley, the park was blocked by high blue walls the last time I was in London. At that time, the best views were from the elevated Dockland Light Rail trains traveling from Stratford to Bow. You can get off at the Pudding Mill Station for a longer view. The building is starting to accelerate and each time I visited more of the buildings are taking shape. I imagine at least some sections of the park are now open to the public. You can see the two Back Rivers that flow through the Olympic park. Abbey Mills Pumping Station (Cathedral of Sewage): This amazing building located alongside a polluted stream and old factories looks really out of place. It is even more bazaar when you realize its function: to pump sewage through the massive main drain underneath the green-way path you’ve just walked on to find this Victorian relic. The architecture provides a reminder of the civic pride the came with the construction of the integrated sewage system in the 1860s. Three Mills Island: This is the oldest remaining tidal water mill in England. 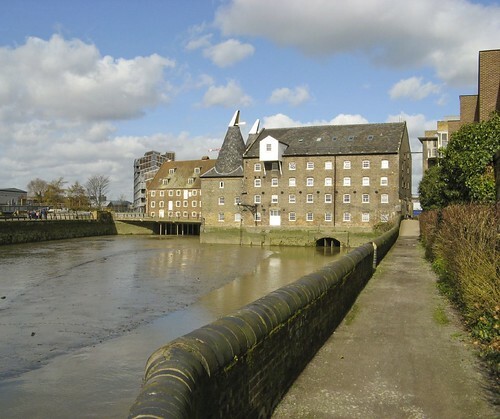 There have been tidal mills on the Lower Lea since before the Norman Invasion in the 11th century and the House Mill building dates back to the early 18th century. You can also admire the massive gasometers just south of Three Mills and consider the changing scale of industry between the 18th and 19th centuries. The Royal Docks and the Excel Centre: The former docks provide an excellent opportunity to see the process of revitalization underway in this region, as the warehouse have been replaced with a university, an airport and a large conference facility. The Excel Conference centre will host some of the Olympic events and this is one of the better places in West Ham to find a cluster of nice restaurants. The Thames Barrier: Taking the train out to the amazing flood barrier bring your past the handful of remaining industrial sites in West Ham, including the Tate and Lyle sugar refinery. The Lea Towpath: If you are lucky enough to be in London during nice weather the many tow paths along the old canals are great locations for walks. You can walk north along the River Lea miles, all the way to Waltham Abbey if you are feeling really ambitious. R. A. Bray, “Review: West Ham A Study,” The Economic Journal 18, no. 69 (March 1908): 60-64.